There are endless tools available for online marketing, so why would e-commerce retailers like Ikea, Bonobos, Athleta, Boden, Williams-Sonoma, or Neiman Marcus Group, consider a physical catalog marketing strategy? Catalogs stay popular because they have a greater impact on the customer, and more effectively deliver a brand’s discounts, special offers, and featured items. This marketing method engages directly with customers, and is a big part of a true multichannel environment. If you want to learn about the advantages of catalog marketing available to you, here’s what you need to know. Why Are e-Commerce Retailers Using Catalog Marketing? Despite the advancement of technology and the incredible reach of online marketing, print and direct mail marketing still brings in a higher return on investment than almost every other type of marketing, except telemarketing. Also, there is a significant percentage of customers who still browse catalogs before making an online purchase. Almost half of consumers everywhere still prefer to receive a catalog in the mail than perform a search on Google. Additionally, more than half of consumers prefer to browse catalogs before going into a brick-and-mortar store to make a purchase. Here is a breakdown of some of the clearest reasons why you should include a catalog marketing strategy in your campaign. Catalog marketing is more affordable than you might think. Catalogs cost about one dollar per piece, but they are able to generate an average of $4.00 in sales. If you spend $1,000 on your catalog marketing strategy, you can expect to see $4,000 in sales. The more catalogs you send, the more customers you’ll reach, and the more sales you will make overall. This makes a great option for businesses with all different kinds of budgets. If your end goal is to grow your business, it makes sense to include a reasonable budget to create and distribute your catalogs. Although online marketing may seem simple and effective for retailers, consumers actually prefer to read a catalog. If you are trying to reach your customers via e-mail, it is quite easy for them to delete it. 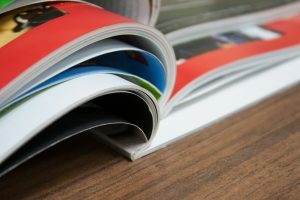 But, when they receive a catalog in the mail, the visuals and text can have a greater impact on them, and they’re more likely to skim through it while they enjoy their breakfast, or on their lunch break. Compared to paid searches and e-mail marketing, catalog marketing is a better way to spend your marketing funds. This is because companies see a much higher return on investment when using catalog marketing. Paid search and e-mail marketing can be quite expensive, but it costs much less to distribute catalogs, meaning you can make more money in the long run. Statistics show that direct mail has a higher response rate than digital marketing. Every day when consumers log online, they are bombarded by hundreds of ads and marketing materials. Although many customers prefer to shop online and are easily drawn in by online advertising, others can become desensitized to the ads, and completely miss your message. This is one reason why catalogs and direct mail materials can lead to a better conversion. As previously mentioned, consumers can easily get overwhelmed with online ads and marketing, but like reading a book, catalogs keep the attention of potential buyers for a longer period of time. While people tend to prefer instant gratification when they use the Internet, they seem to enjoy slowing down long enough to flip through a catalog or magazine. As companies become more technological and Internet savvy, e-commerce is expected to rise more than ever. That being said, even online retail stores should not count out catalogs. Consumers who shop online typically spend an average of $80 per order. Those who search a catalog before shopping, even if they are shopping online, spent an average of $90 dollars per order. The fact is undeniable—catalogs get people excited. Every holiday season, people love browsing catalogs to find out what new swimsuits and beach gear is on sale from some of their favorite brands. People can flip through a collection of everything your company offers, inspiring them to spend more, buy more frequently, and share your message with their friends and family. Catalogs provide brand recognition and product awareness in a way that is not as readily available on the web. It is critical for retailers to keep in mind that the branding process across all channels must be consistent. This is why online proofing is always necessary to maintain brand integrity. Catalogs have proven to be a powerful branding tool, so make sure you ensure there is a consistent transition between your catalog and your web site or mobile app. The success of your retail endeavors relies heavily on your ability to utilize multichannel marketing. E-mail campaigns, online advertising, and attractive web sites all improve the customer’s buying experience, and contribute an element of branding. Catalogs are a vital component that can lead consumers directly to your brand. Now that you’re aware of the importance of catalogs in business, you might want to take the opportunity to set up a campaign. Thankfully, you don’t have to blindly begin this process. Macromark provides catalog marketing services, as well as direct mail listing, subscription box services, and many others. We can help you understand this opportunity to grow and acquire a bigger customer base. We can provide all the information, advice, and assistance you need to get your direct mail marketing campaign up and running. Our services also include print media, direct mail marketing, list brokerage, data solutions, list fulfillment and list management. For more information about how we can help grow your business, contact us at 1-(845) 230-6300.